I’d like to start by stipulating I am by no means an expert in post-apocalyptic fiction. I don’t go looking for genre but take it where I find it. For the most part I found it as an early teenager when as geeky girls, my best friend and I searched the stacks of the library to find what we could. A geeky girl now would have a much wider choice. 1. Death of Grass – John Christopher. Between the ages of twelve and fourteen I almost exclusively read post-apocalyptic fiction, mostly by John Christopher (the Tripod trilogy) and John Wyndham (The Chrysalids was my favourite). For the most part I saw them as strange and different worlds without questioning how they got to be that way. Death of Grass didn’t make as big an impression on me at the time as some of those others. It was a slow simmer. The relatively mundane mechanism of The End – a disease which wiped out grass and hence wheat, rice and almost all other staple crops – and the emphasis on the practicalities of survival did, however, leave my teenage self obsessing about how many potatoes we could grow in our family’s backyard and if our front wall was tall enough. It came back to me when I was writing Before This Is Over, coming up with ways the random and dwindling contents of a kitchen cupboard could be combined to produce something approaching a meal. 2. Things We Didn’t See Coming – Steven Amsterdam. 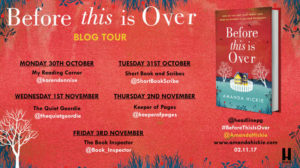 An impressionistic series of connected short stories – or is it a novel? – that is atmospheric and brooding. Something has gone terribly wrong and each chapter is a self-contained moment that reveals a little more of the situation that even those in it don’t completely understand. A little reminiscent of McCarthy’s The Road. 3. Station Eleven – Emily St. John Mandel. A virulent disease breaks out in North America and our protagonists hit the road. Twenty years later, we follow a roaming band of Shakespearean actors who are keeping at least part of our culture alive in a society which is starting to forget what the internet, or even electricity, was like. Action packed but also gentle and in the end optimistic. The message I took away is that as a species we are resilient. Civilisation might ebb and wane but over time we always find a way to rebuild. 4. Journal of the Plague Year – Daniel Defoe. Not really post-apocalyptic and probably not fiction. Written in 1722 about the 1665 London black plague, possibly based on his uncle’s experience in what must have felt like the end of the world. If you can get past the archaic language, it is full of small experiences of both the world falling apart and continuing. When I was writing Before This Is Over I realised that for all the technological progress of the last four hundred years, many of the problems we’d face and ways we’d cope would not be that different. 5. On The Beach – Nevil Shute. I’m embarrassed to say that I’ve never seen the film with Gregory Peck and Ava Gardiner and only read its source material – a classic Australian novel – recently. Written and set in the fifties, the worst nightmare of the Cold War has come to pass and Australia, too far away to be of interest to the major powers, is only waiting for confirmation that nuclear war has wiped out everyone in the northern hemisphere. There is nothing to do but wait for the toxic clouds of fallout to reach them. It’s T.S. Eliot’s famous line of ending with a whimper in novel form. A chilling examination of life with an end date – including for a newborn child. My high school looked across the harbour to the CBD of Sydney. Unlike Shute, as a teenager I was convinced Sydney would serve as a good warning shot for Soviet missiles. I spent more than one French lesson wondering whether I would have a ringside seat to the first act of WWIII when I should have been conjugating verbs. 5½. Halibut, Herring and You – Carla Billinghurst. Since the official list is done, I can slip in a zombie exception that’s not a novel. The Zombie Research Society recently nominated Australia as the best place to survive a zombie apocalypse. They clearly hadn’t read this collection of short stories which includes several hilarious tales of zombie apocalypse. You’ll never look at a kangaroo the same way. Thank you so much, Amanda for such interesting choices. 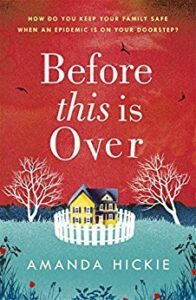 Before This Is Over is available now in ebook and from 2nd November in paperback. Please check out the other blogs taking part in the tour. Amanda lives in Sydney with her husband, two sons and two cats. I’ve never really thought of On The Beach as post-apocalyptic fiction before, but I suppose it is. That’s an interesting list of novels.